Drs. Neal Benowitz and Jack Henningfield were respected tobacco researchers in 1994 when they introduced a flawed smoking cessation prescription: force smokers to quit by reducing the nicotine content of cigarettes (here). I criticized the idea in my 1995 book, For Smokers Only (now available as an e-book with a bonus chapter on e-cigarettes). In the 20 years since, the nicotine fadeout strategy has failed to gain traction, while the alternate concept of tobacco harm reduction has attracted substantial support. When Drs. Benowitz, Henningfield and their anti-tobacco allies attempted five years ago to resurrect nicotine fadeout as an FDA regulatory strategy, I labeled it “the most idiotic idea ever proposed by tobacco control advocates” (here) and described “the disaster that would result from radical reduction (prohibition) of nicotine in cigarettes” (here). Today we have a fresh clinical trial (abstract here) from Dr. Benowitz that may mark the last gasp for this scheme. Dr. Benowitz and coworkers enrolled 135 smokers who were “interested in a reduced nicotine cigarette study, and not interested in quitting smoking in the next 6 months.” Eighty participants “smoked five levels of progressively lower nicotine content cigarettes, the first four levels being smoked for 4 weeks each. The lowest nicotine content cigarette was smoked for 7 months. [I call this the fade-out group.] The control group smoked their usual brand of cigarettes for 12 months.” Everyone got a year’s worth of free cigarettes, and information was collected for one additional year. The results were dismal, starting with completion rates. Smokers were paid to participate, which may have prompted 87% of the control group to complete the first year and 69% to make it through the second; the rates in the fade-out group were 46% and 38%. The authors reported that “Quit rates were low in both [fade-out] and control groups, and not significantly different between groups at any time.” That is an understatement. The quit rate, validated by lab studies, was 2% among controls at one year and at two years. Among the fade-out group, the rates were 3.8% at one year and 7.5% at two years. There’s more bad news. At one year, 43% of fade-out smokers admitted they had violated the study protocol by smoking regular cigarettes. Dr. Benowitz, welcome to Tobacco Harm Reduction. 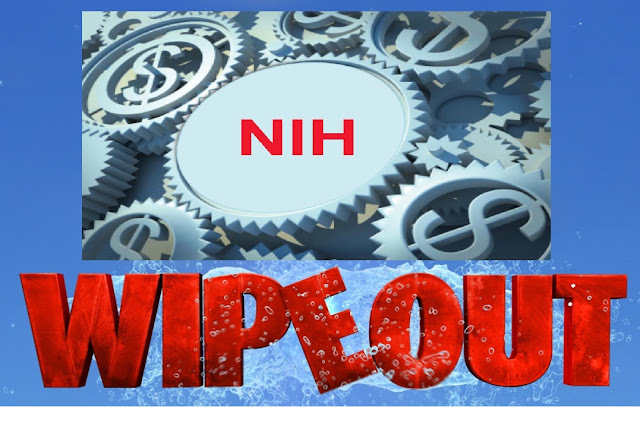 A final note: I recently discussed how the National Institutes of Health have influenced the debate about tobacco harm reduction by doling out massive grants to university researchers nationwide (here). The Benowitz study was supported by four grants from the National Cancer Institute and the National Institute on Drug Abuse; the total taxpayer tab was $29.2 million. Today The Daily Telegraph published a correction of false information in an article demonizing e-cigarettes, following review by Britain's Independent Press Standards Organisation (here). The correction was published on page 4 of the newspaper (left) and online. The original story, “Four in 10 teenage e-cigarette users would not have smoked, warn health experts,” was authored by science editor Sarah Knapton on March 31 (here). The article’s subtitle and the lead sentence repeated the theme that “teenagers who would never have smoked are now using e-cigarettes” (my emphasis). transformed into using e-cigarettes NOW…In addition, Knapton falsely converted teenagers who had never smoked in the past or who had tried it but didn’t like it into teens who would have NEVER started to smoke. “These items are not just marginally inaccurate summaries, and they do not involve methodological complexities; they represent misuse of simple English words to conflate ever e-cig triers to current users and to redefine teens who hadn’t started to smoke as those who would never smoke. The article remains inaccurate and misleading, and it still requires amendment. 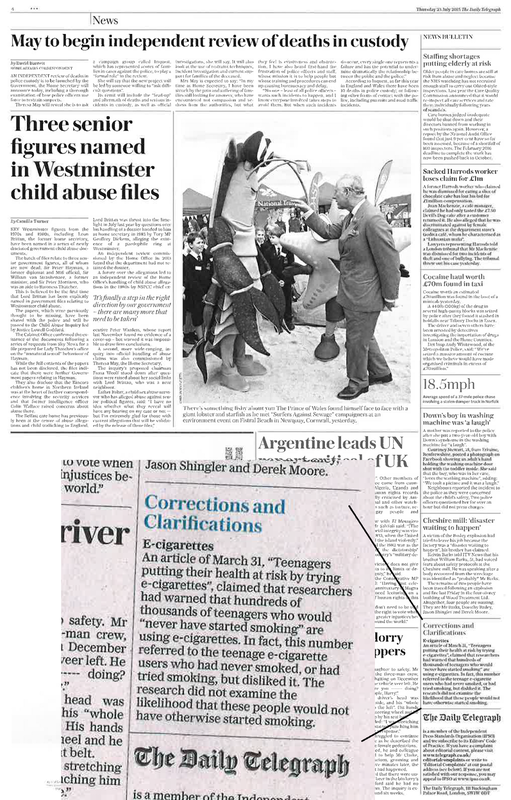 Telegraph editors made a last-ditch, insufficient change on May 19, removing the phrase “would not have smoked” from the headline, but they made no substantial changes in the subhead or article (second photo). Finally, on June 25, the IPSO notified me of their finding that The Telegraph article was misleading in redefining teens who hadn’t started to smoke as those who would never smoke. 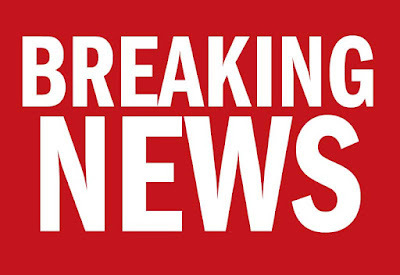 IPSO required the paper to take remedial action: “The article was on page 12 of the newspaper, and correction should be published on this page, or further forward in the newspaper. The correction on the online article should make clear that the article had since been amended, and should be published at the foot of the online article.” The IPSO published my complaint and its decision here. The IPSO should have acknowledged that The Telegraph mislabeled teens who had ever tried or purchased e-cigarettes in the past as users of e-cigarettes NOW. However, this part of my petition was not upheld. I am disappointed that the IPSO allowed the newspaper to transform ever use of e-cigarettes into current use. Additionally, the IPSO inaccurately reported my complaint by not including the word “now,” which The Telegraph used in describing e-cig use in its subhead, first paragraph and fourth paragraph. The IPSO exists “to promote and uphold the highest professional standards of journalism in the UK, and to support members of the public in seeking redress where they believe that the Editors' Code of Practice has been breached.” The organization maintains high standards of journalism, and it has a high bar for complaints. Of the 188 complaints reviewed by the committee since its establishment in 2014, only 41 (22%) have been confirmed. 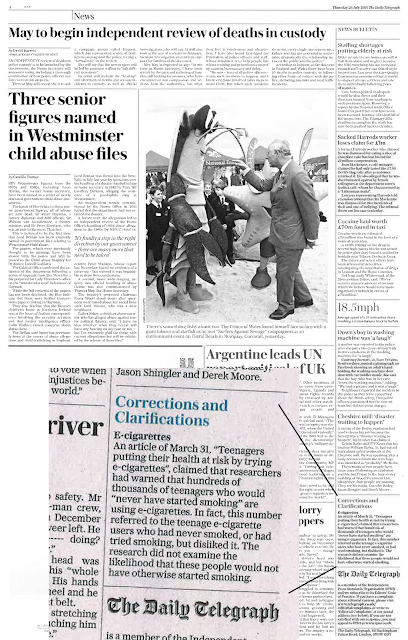 Fourteen complaints against The Telegraph have been reviewed; mine is the third to be upheld. The IPSO decision sends a message to the British news media: Get your facts straight when reporting about e-cigarettes. It’s a shame that there is no equivalent media watchdog in the U.S.
Last week I announced first-ever national estimates, generated from new CDC data, of U.S. e-cigarette users in 2014, almost two million of whom are former smokers. 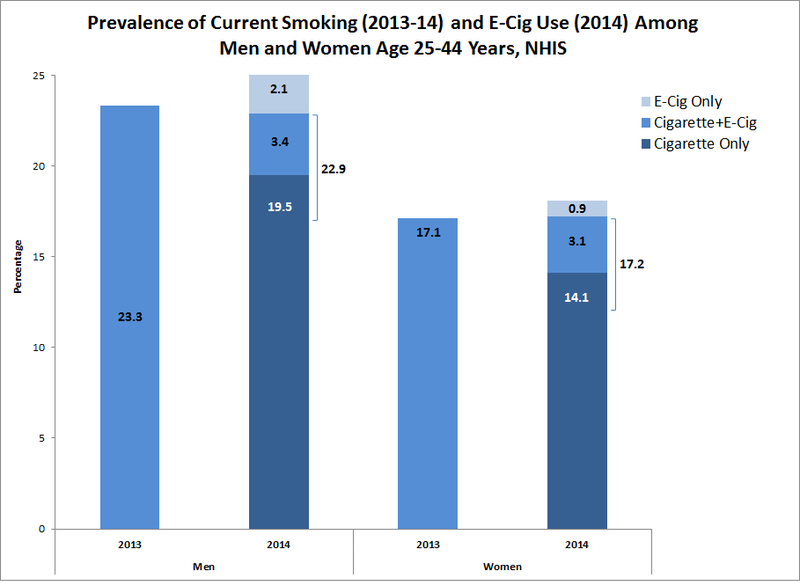 Here, I provide more information about current e-cigarette use, especially in the context of current smoking. 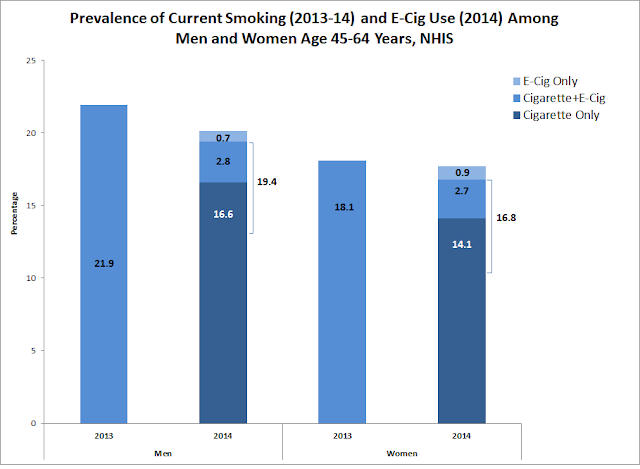 The first chart shows the percentages of men and women in the U.S. who smoked in 2013 and 2014, along with e-cigarette use in 2014. Among men, smoking declined from 20.5% to 18.8%, despite the fact that 4.2% were e-cigarette users. Smoking among women also declined, although the drop wasn’t as strong. 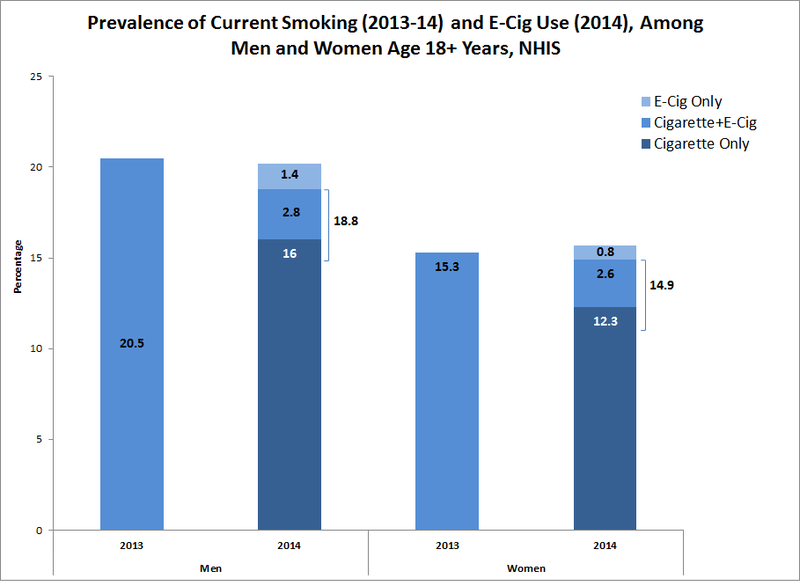 Overall 3.4% of women currently used e-cigarettes in 2014. 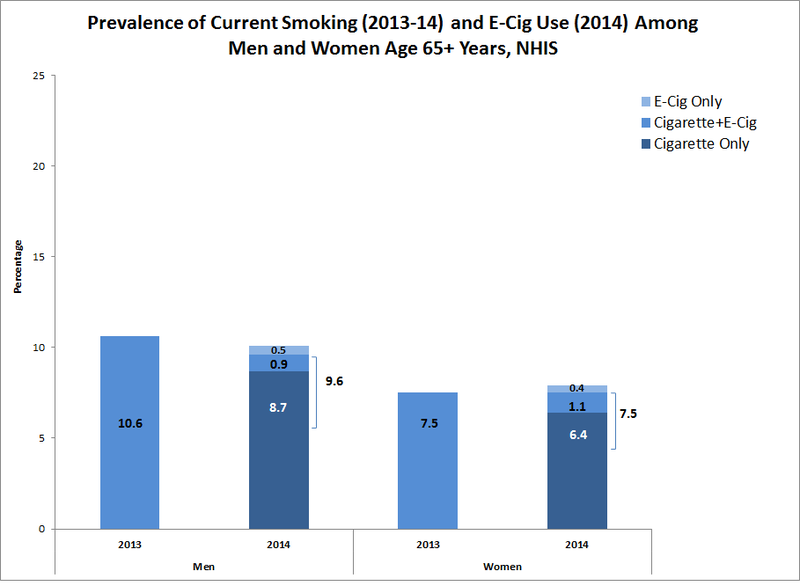 The remaining charts show e-cigarette and smoking rates for men and women ages 18-24, 25-44, 45-64 and 65+ years. Smoking declined among men at all ages, with the largest declines at 18-24 years (-16%), 45-64 years (-11%) and 65+ years (-9%). Among women, declines in smoking were only seen in those 18-24 years (-3%) and 45-64 years (-7%). 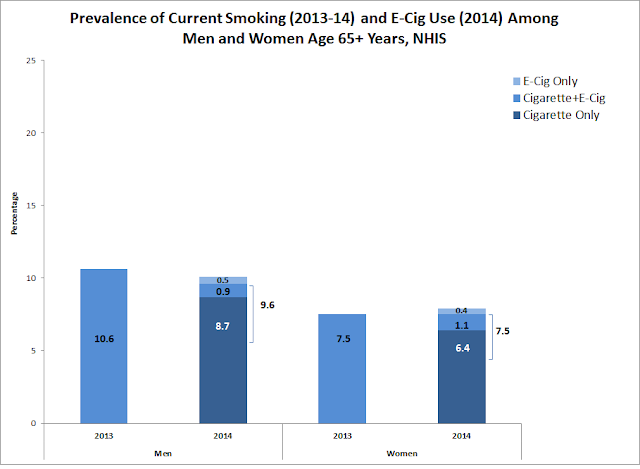 E-cigarette use among men was 5.8% at age 18-24 years and was lower in each successive age group. 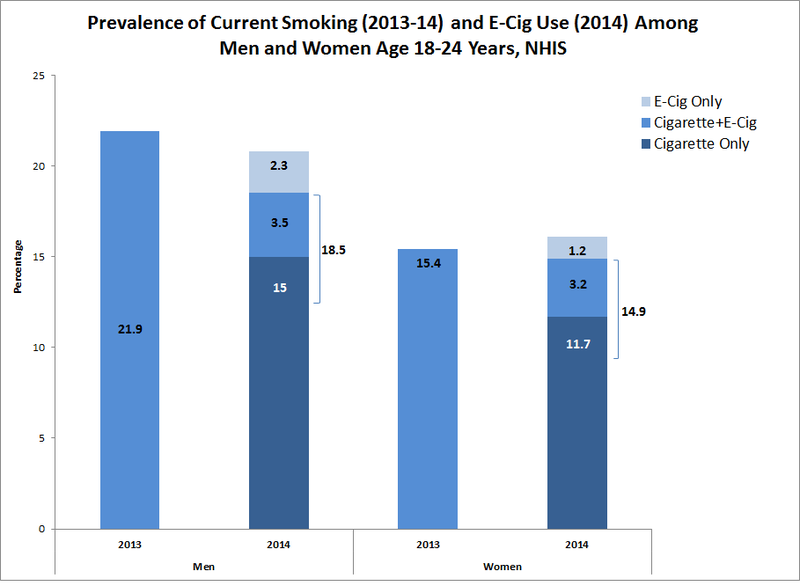 The same pattern occurred among women, with 4.4% of 18-24 year olds vaping. While prohibitionists insist that e-cigarettes will “re-normalize” smoking and erase decades of progress, CDC data clearly show that smoking continued to decline in 2014 as e-cigarettes surge in popularity. Analyzing fresh data from the 2014 National Health Interview Survey, which involved nearly 37,000 respondents, it can be estimated that 30 million American adults have used an e-cigarette at least once, and 8.9 million were current users in that year. The data was released by the CDC June 29. This was the first time that the NHIS, the main source for national smoking prevalence statistics, asked about e-cigarettes. The survey asked participants if they had ever used e-cigs, even one time; if they had, a second question asked them if they currently used them every day, some days or not at all (hereafter, triers). From this data I have produced the first-ever national estimates of e-cigarette use. About 71% of e-cigarette users are also current smokers (every day or some days), and 22% are former smokers. The rest (about 7% or 595,000) were never cigarette smokers, but nearly 70% of them said they smoke products other than cigarettes (cigars, pipes, water pipes or hookahs, very small cigars that look like cigarettes, bidis or cigarillos) every day, some days or rarely. Of the 6.3 million smokers who used e-cigarettes, only 22% used them every day. In contrast, among the nearly 2 million former smokers who used e-cigarettes, about 63% – or 1.25 million – were daily users.. Among never cigarette smokers who vaped, only 16% were daily users. Among daily smokers, there was virtually no difference in cigarette consumption; regardless of whether they vaped or not, daily smokers consumed 14-15 cigarettes per day on average. Cigarette consumption was more variable among some-day smokers: those who used e-cigarettes every day smoked only 3.5 cigarettes on the days they smoked, while those who used e-cigs on some days smoked 5.2 cigarettes. Some-day smokers who had tried e-cigarettes consumed 7.8 cigarettes per day, while those who had never used an e-cig smoked 5.6 cigarettes. While it is encouraging that almost 2 million former smokers were currently using e-cigarettes in 2014, it is not possible to prove that they had used e-cigarettes to quit. However, 85% of these former smokers had quit 5 years or less prior to the survey, making it plausible that e-cigarettes played some role in their becoming or staying smoke-free. The table below compares some characteristics of former smokers who currently used e-cigarettes with former smokers who never used them. (These comparisons are general observations that might change after additional analysis). Former smokers who used e-cigarettes were younger and more likely to live in the South; they looked more frequently for health information on the internet during the previous 12 months. Another statistic stands out: In 2014, the percentage of adults in the U.S. who smoked was 16.8%, down from 17.8% in 2013. Cigarette smoking in the U.S. continues an inexorable decline. Rather than impeding progress, e-cigarettes may be accelerating a smoke-free revolution.